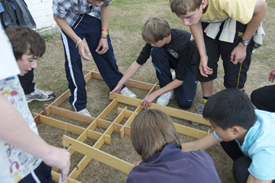 If your Secondary School is looking to hold a maths enrichment day the The Problem Solving Company’s KS3 and KS4 maths activity days are a great way to involve either small numbers of students or whole year groups. If you are requiring your students to take part for a lesson of your school day, our instructors can work on a rotation, delivering the workshop a number of times. This is typically 5 or 6 times in a Secondary School. A new activity that delivers Maths Problem Solving Activities to classes through the day is our School Escape Rooms – Maths Escape. For large number of students to participate for longer durations, we can provide an instructor for each 30 students involved. We aim to timetable the day so that these groups of students will rotate around the different instructors through the day. This will allow participation in a large range of maths activities and puzzles. This rotation can be independent to you normal school day or can be integrated into your normal school lesson timetable. A new option for larger numbers of students is our Maths Challenge Carousel. This incorporates 32 Maths Problem Solving Activities that offers full day sessions for large numbers of students. If you are looking for a smaller group of students to participate such as Gifted and Talented pupils or students that need extra help then these requirements can also met. In addition you may have requirements different to those set out above. Should this be the case then please do let us know and we can discuss a program that will suit your school. Our maths activity days are a great way to get students to engage with maths in a different way than the normal classroom lessons and one that is always found to be fun. If any of the options interest you please do contact us.